All our natural skin care products are eco-friendly. Beauty Colleges and students, please enquire with us for workshops, courses and special prices and deals. 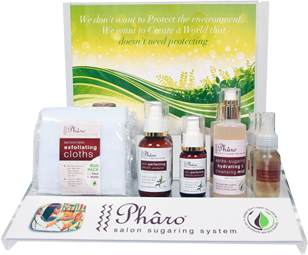 Phâro Apres Sugaring hydrating and cleansing mist. Infused with Witchhazel and Arnica. This cooling spray is used after sugaring to sooth, cool and moisturize the skin. The Arnica and Witch-hazel have proven effectiveness against any redness and spotting that may occur in pulling the hair out. Phâro Apres Sugaring hydrating and cleansing mist. Infused with Witch-hazel and Arnica. This cooling spray is used after sugaring to sooth, cool and moisturize the skin. The Arnica and Witch-hazel have proven effectiveness against any redness and spotting that may occur in pulling the hair out. Exfoliation is an essential component for youthful looking skin and to reduce the occurrence of ingrown hair after sugaring. 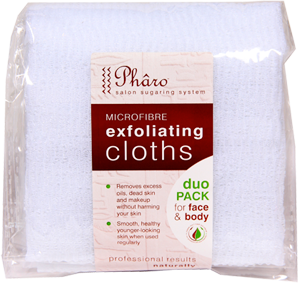 This handy pack contains two large reusable microfibre exfoliating cloths for all body use. Use regularly as part of a shower routine for skin that will be ready for your beauty routines. Phâro Skin Perfecting Serum is a versatile serum which assists with problematic skin and post care of your client’s skin after sugaring, resulting in a dramatic decrease of ingrown hairs. Formulated with willow bark, a natural source of salicylic acid which acts as a topical antibiotic treatment for problematic skin conditions, and aloe vera, witch hazel and tea tree oil help to revitalise your skin and perfect your complexion.